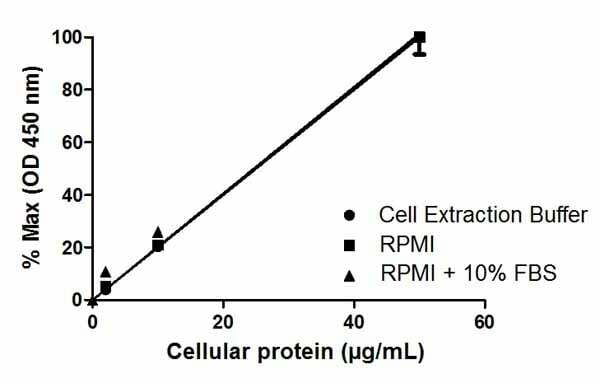 GAPDH in vitro SimpleStep ELISA™ (Enzyme-Linked Immunosorbent Assay) kit (ab176642) is designed for the semi-quantitative measurement of GAPDH protein in human and mouse cells. Our Abpromise guarantee covers the use of ab176642 in the following tested applications. Example of a typical GAPDH cell lysate dilution series. Background-subtracted data values (mean +/- SD) are graphed. 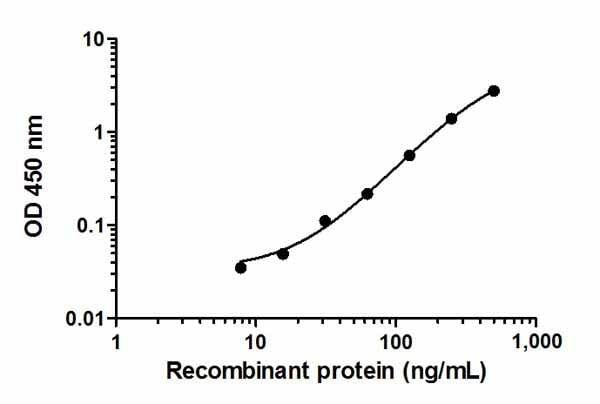 Example of a typical GAPDH recombinant protein standard curve. Background-subtracted data values (mean +/- SD) are graphed. Linearity of dilution in representative sample matrices. 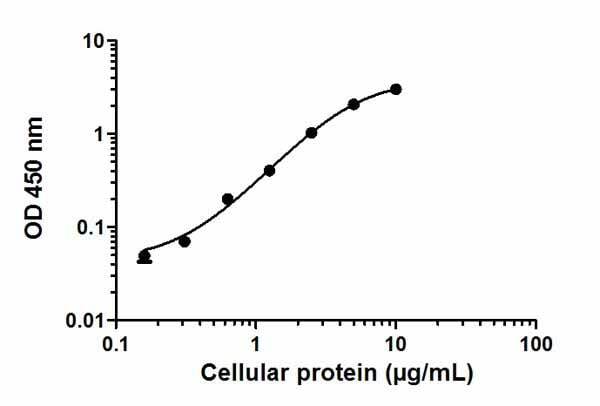 Cellular lysates were prepared at 3 concentrations in common media containing 1 x Cell Extraction Buffer PTR. Data from duplicate measurements of GAPDH are normalized and plotted. Cell line analysis for GAPDH from 5 µg/mL preparations of cell extracts. Data from triplicate measurements (mean +/- SD) are plotted and compared to 1X Cell Extraction Buffer PTR (zero). Publishing research using ab176642? Please let us know so that we can cite the reference in this datasheet. I ordered the GAPDH ELISA as I need a housekeeping protein that is present in the medium. 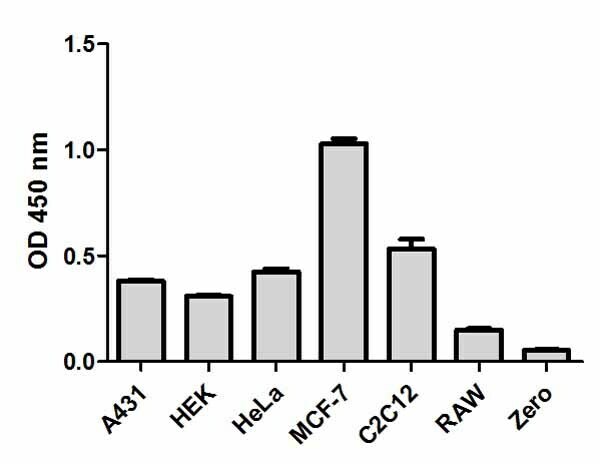 GAPDH is reported to be present extracellularly but there did not appear to be any ELISAs on the market that can measure GAPDH in the culture medium. 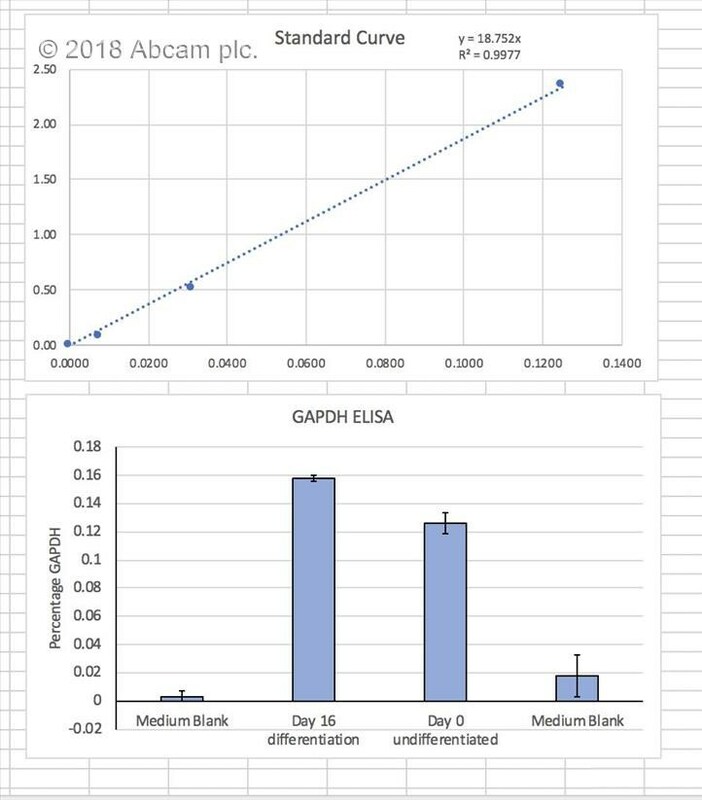 On testing this ELISA we found that GAPDH was present both in our human embryonic stem cell culture medium and in our neuronal differentiated cell culture medium, whereas it was not present in the culture medium alone. The cell culture medium was run undiluted on the ELISA. The only disadvantage that we found with this kit was that the kit does not provide absolute concentrations for GAPDH, this could easily be solved by providing a known mass of GAPDH.